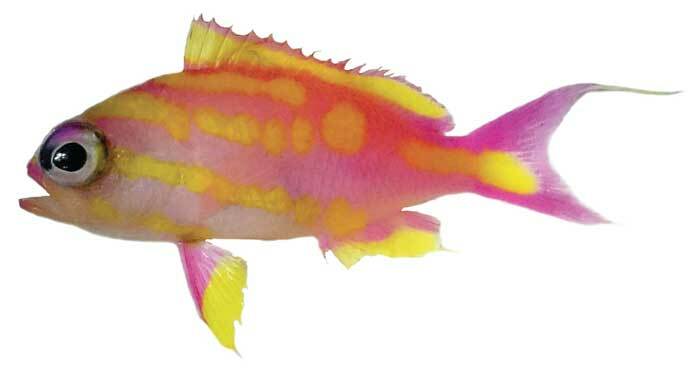 Tosanoides bennetti, here is another discovery of colorful deep water anthias from the Coral Sea, Australia. Collected from the depth of 141-150 m at the Holmes Reefs. Which is approximately 220 km east of Cairns, Queensland, Australia. The fish is so mesmerizing with its colors of electric pink and yellow with the band patterns. Last year we had beautiful Tosanoides annepatrice and Tosanoides aphrodite in spotlight. So far all the species in the Tosanoides genus the most beautiful specimens collected. In 2016, Tosanoides obama is discovered and was named in the honor of U.S. president Barack Obama. Other than the above four Tosanoides we have T. flavofasciatus found in the year 1980 and T. filamentosus found in the year 1953 in Japan. With Tosanoides bennetti we have six recognized species in this genus. The complete set of description papers on Tosanoides bennetti are with aqua, International Journal of Ichthyology.